Last December, Ravens defensive end DeAngelo Tyson alertly secured his first NFL interception off a tipped pass from Detroit Lions quarterback Matthew Stafford. It was a glimpse of Tyson's athleticism last year, when he had 10 tackles and two sacks in 13 games while operating as part of the Ravens' defensive line rotation. It was also the biggest play Tyson has made in his first two NFL seasons. 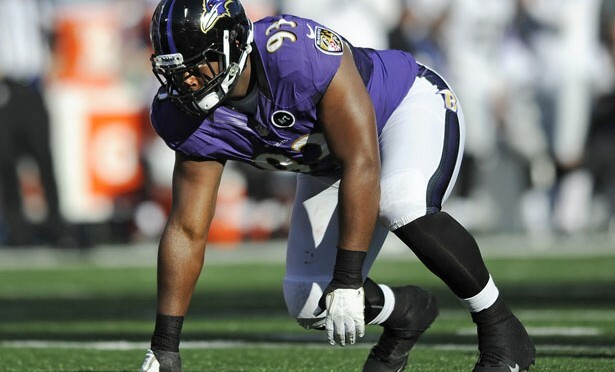 With former Ravens starting defensive lineman Arthur Jones now with the Indianapolis Colts after signing a $33 million free-agent contract in March, there's an opportunity for Tyson to increase his playing time. "It's always an opportunity, it's always competition in everything you do," said Tyson, a 2012 seventh-round draft pick from Georgia. "I like the competition. I"m ready to do everything I can. "I was just glad I got the opportunity to play. God blessed me with talent, but it's up to me to do something with it. So, I'm just going to do my best and continue to work hard." Tyson is vying for a role along with several other players, including Brandon Williams, who lined up with the starting defense during organized team activities and minicamps, rookie Timmy Jernigan and Kapron Lewis-Moore. "The competition is there," Tyson said. "Nobody is going to give you anything in life. You have to work for it. Everybody is going to have to work to play, including veterans and rookies." Tyson is a former high school All-American from Statesboro, Ga., who was an All-Southeastern Conference freshman selection. He had 79 career tackles in college with three sacks, one forced fumble and 23 quarterback pressures. The 6-foot-2, 310-pound lineman hopes to build on his progress from last season, which included a career-high three solo tackles during a loss to the New England Patriots in December. "I'm always in good shape," Tyson said. "I know it's a business. You've got to come prepared. I definitely came prepared this year. I'm excited about everything that's going on and getting ready for training camp and the season."